Another card is on the banlist! 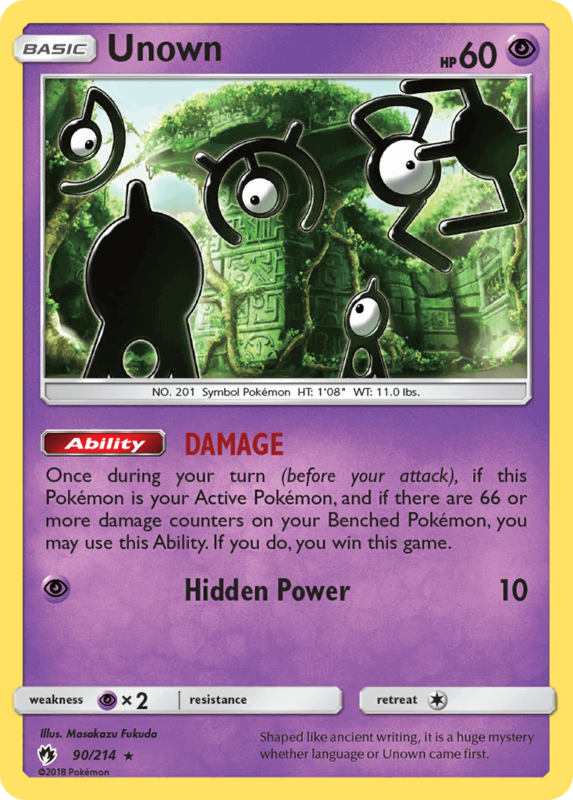 The Japanese Pokemon TCG has recently announced that Unown with the DAMAGE ability from Lost Thunder will be banned. This bad is only in the Japanese Expanded format. This is because the card can create a game state that your opponent is unable to respond to. In this case, the game could be done in two turns without your opponent having the chance to play a proper game or time to respond. Unown with the DAMAGE ability allows you to win the game if you put Unown into the active when there is 66 damage counters on your Pokemon. This may sound like a tall order but it can be done with a few cards in the Expanded format. You will need the following cards to pull off this two turn combo: Unown DAMAGE, Reuniclus (Black & White), Wailord EX (Primal Clash), Weavile (Steam Siege), Klefki (Steam Siege), and Team Magma’s Secret Base (Double Crisis). You will need to have Team Magma’s Secret Base on the field. That way it will put damage counters on all non-Team Magma Pokemon that you put on the bench. This could wait until your second turn. Though, on your first turn you will need to ensure that you have Wailord EX, Sneasel and Solosis on the field. During your second turn you will want to evolve your Pokemon into Reuniclus and Weavile. Once you have done that, place down Team Magma’s Secret Base and Klefki. You will get damage counters when you put Klefki on the bench. Next, you will then use Reuniclus’s Damage Swap ability to move the damage off of Klefki and onto another Pokemon. Once that is done, you will use Klefki’s Wonder Lock ability to attach it to a Pokemon. Weavile’s Tear Away ability can then be used to put Klefki back into your hand. You will repeat this cycle again and again until there is 66 damage counters on the field. It isn’t certain if the above combo is the reason for Unown- DAMAGE’s ban. There are other ways using Frozen City (Plasma Freeze) and Blastoise (Boundaries Crossed). Though, this combo seems like the most restricting if pulled off as it only gives your opponent two turns at most to win. It is unsure if Unown- DAMAGE will see a ban in the US/Worldwide TCG. According to Immewnity on Twitter, not all cards in the Japanese TCG get international bans. Though, that could change with the release of Team Up this February. An example of this could be Maxie’s Hidden Ball Trick. Currently this card is only banned in the Japanese TCG Expanded format. Though, this ban was recently done prior to the release of Tag Bolt in Japan (Team Up in US). So we could see Maxie’s Hidden Ball Trick get banned with the upcoming Team Up Quarterly Report in the upcoming week. Unown- DAMAGE could see a ban for the international TCG but with the release of Unbroken Bonds. This may be for two reasons. The first reason could be tPCI observing the format to see how Unown- Damage is used within the format. The other reason could be due to how some cards in Japan’s Full Metal Wall reacts to a card in Expanded. Cards from Full Metal Wall will be release in the US in Unbroken Bonds. The other possiblity is that today’s annoucement in Japan is giving US players a sneak peek into the upcoming Team Up Quarterly Report. Unown- Damage ban will be in effect starting on February 1st in Japan. ← Team Up Prerelease Promos Reveal!